I read out the date; Ten Two Twelve, it sounds like a time check, nearly noon, or nearly midnight. It is midmorning. The sky is a blur of wet grey. There’s no amazement from anyone that cloud covers the whole of the visible earth, it’s merely a bland layer. People are mentioning that the weather has warmed, to balance rain disappointment. I wonder if our reluctant daffodils will open some buds. I can see wet naked hazel branches from the window, sat with my notebook while Baby sleeps. 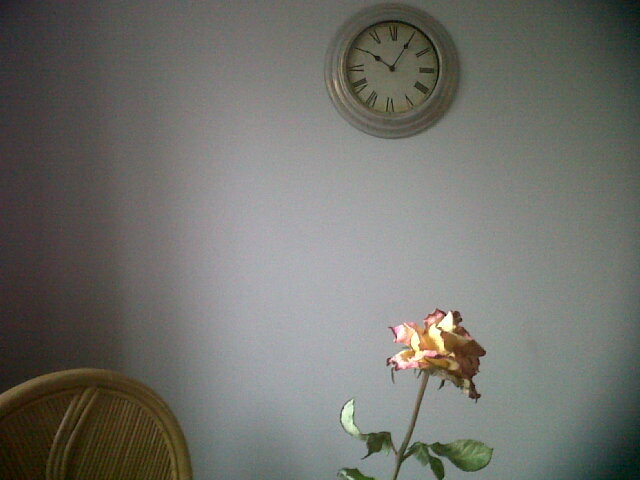 A rose in a single stem vase has not run out of water but the heated indoor air has dried the flower petals. The clock here does not tick, it makes a subdued rhythmic rattle, like a heart monitor picking up an unborn beat. I am doing that dangerous thing, picking up my pen and deliberately thinking of what to write, when I write the date and read it out loud.